Last Monday we took a look at my neighbours unfinished baby blanket. It's completed now, with a sweet little border added to give it that finishing touch. 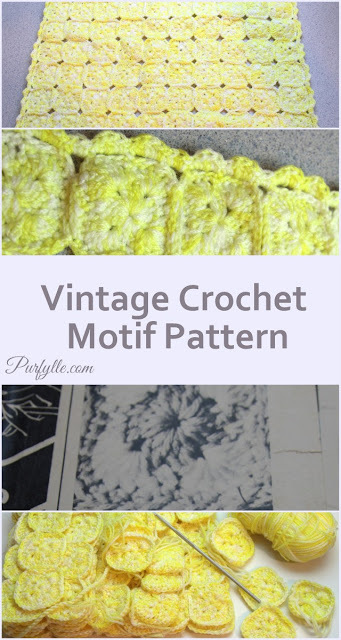 I've got the original pattern to share with you too. My neighbour was thrilled to have this blanket all complete just when her grand-niece is 2 months old. The timing could not have been more perfect. 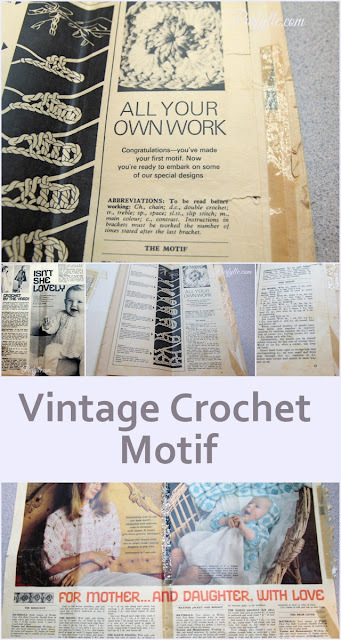 Unfortunately there is no date on the crochet pattern, however the other patterns she had stored with it were dated to 1976 and looking at the magazine photo's I suspect the pattern for this project is from around the same time. It's almost as old as I am! There was nothing to indicate which magazine this pattern came from either. There were instructions for making the stitches, making the motif, as well as more projects to create using the motif; a bedjacket, a baby's matinee jacket and bonnet. I removed the sheet of paper from the scrapbook to see what was on the back hoping to find a date, there was another crochet pattern for a scarf and the start of yet another for a baby's outfit. I can't say I'm a fan to be honest. I've never had much of a thing for yellow though so I'm a bit biased. How nice of you to finish it for her!! She deserves to get what little happy moments she can in this life now, she has lost her husband and both her boys. It was the least I could do. It is so sweet she held onto it for all these years. Very pretty. It looks like a lot of work - all that joining. Whew! Joining is just 2 stitches on either side of each corner -went nice an fast.